MRI (Magnetic Resonance Imaging) scanning is a medical investigation that uses an exceptionally strong magnet and radio frequency waves to generate image of your body. A magnetic resonance imaging instrument (MRI scanner), or "nuclear magnetic resonance (NMR) imaging" scanner as it was originally known, uses powerful magnets to polarise and excite hydrogen nuclei (single proton) in water molecules in human tissue, producing a detectable signal which is spatially encoded, resulting in images of the body. 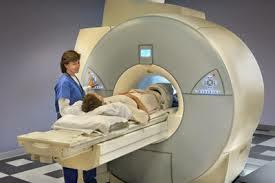 MRI scan has wide range of application in medical diagnosis . Oncology:MRI is the investigation of choice in the preoperative staging of rectal and prostate cancer, and has a role in the diagnosis, staging, and follow-up of other tumors. MRI uses three electromagnetic fields: a very strong (on the order of units of teslas) static magnetic field to polarize the hydrogen nuclei, called the static field; a weaker time-varying (on the order of 1 kHz) field(s) for spatial encoding, called the gradient field(s); and a weak radio-frequency (RF) field for manipulation of the hydrogen nuclei to produce measurable signals, collected through an RF antenna. During an MRI scan, you lie on a flat bed that is moved into the scanner. Depending on the part of your body being scanned, you will be moved into the scanner either head first or feet first. The MRI scanner is operated by a radiographer, who is trained in carrying out X-rays and similar procedures. They control the scanner using a computer, which is in a different room to keep it away from the magnetic field generated by the scanner. You will be able to talk to the radiographer through an intercom and they will be able to see you on a television monitor throughout the scan. At certain times during the scan, the scanner will make loud tapping noises. This is the electric current in the scanner coils being turned on and off. You will be given earplugs or headphones to wear. Like CT, MRI traditionally creates a two dimensional image of a thin "slice" of the body and is therefore considered a tomographic imaging technique. Modern MRI instruments are capable of producing images in the form of 3D blocks, which may be considered a generalisation of the single-slice, tomographic, concept. Unlike CT, MRI scans do not use X-rays so the possible concerns associated with X-ray pictures and CT scans (which use X-rays) are not associated with MRI scans.. For example, because MRI has only been in use since the early 1980s, there are no known long-term effects of exposure to strong static fields (this is the subject of some debate; see 'Safety' in MRI) and therefore there is no limit to the number of scans to which an individual can be subjected, in contrast with X-ray and CT. However, there are well-identified health risks associated with tissue heating from exposure to the RF field and the presence of implanted devices in the body, such as pace makers. These risks are strictly controlled as part of the design of the instrument and the scanning protocols used. Because CT and MRI are sensitive to different tissue properties, the appearance of the images obtained with the two techniques differ markedly. In CT, X-rays must be blocked by some form of dense tissue to create an image, so the image quality when looking at soft tissues will be poor. In MRI, while any nucleus with a net nuclear spin can be used, the proton of the hydrogen atom remains the most widely used, especially in the clinical setting, because it is so ubiquitous and returns a large signal. This nucleus, present in water molecules, allows the excellent soft-tissue contrast achievable . ↑ "ACCF/ACR/SCCT/SCMR/ASNC/NASCI/SCAI/SIR 2006 Appropriateness Criteria for Cardiac Computed Tomography and Cardiac Magnetic Resonance Imaging". Journal of the American College of Radiology 3 (10): 751–771. 2006. ↑ Giussani C, Roux FE, Ojemann J, Sganzerla EP, Pirillo D, Papagno C (2010). 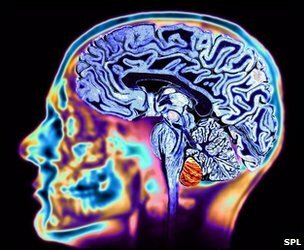 "Is preoperative functional magnetic resonance imaging reliable for language areas mapping in brain tumor surgery? Review of language functional magnetic resonance imaging and direct cortical stimulation correlation studies". Neurosurgery 66 (1): 113–20. doi:10.1227/01.NEU.0000360392.15450.C9. PMID 19935438. ↑ Frydrychowicz A, Lubner MG, Brown JJ, Merkle EM, Nagle SK, Rofsky NM, Reeder SB (2012). "Hepatobiliary MR imaging with gadolinium-based contrast agents". J Magn Reson Imaging 35 (3): 492–511. doi:10.1002/jmri.22833. PMC 3281562. PMID 22334493.